Once the people of the Basin had learned to catch fish on a commercial scale, it was necessary to find a way to exchange the fish for money. This usually involved plugging into a system that had been in existence in the Basin for many years, probably since the early use of gasoline engines in boats. The central part of this commercial system was the part played by the fishboat – sometimes called a trade boat or grocery boat. 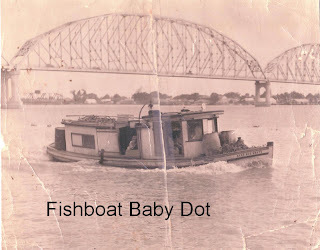 It is difficult to overestimate the importance of the fishboat to the life of the commercial fisherman in the Atchafalaya Basin. It provided a way to sell the fisherman’s product, but it also acted for many people as the only contact with the world outside the Basin. Whether living on houseboats or on the bayou banks, the farther people moved away from centers of population, the more isolated they became with regard to news, medical help and other needs that could only be provided in land-based communities. The link to these occasionally essential places was provided by the fishboats. The experience of the people who were to become the Myette Point community probably serves as well as any to describe the fishboat system and its significance. It is their experience that forms the basis for what is provided here. In the early part of the 20th century the Basin was richly, and widely, populated with people living in houseboats and in more fixed structures on the bayou banks. Given the size of the vessels available to most of them (above right) and the limited range of these vessels, the need for some larger, more seaworthy, means of transporting fish and other goods around the Basin was mostly filled by the efforts of the fish docks that collected the Basin fish for processing and distribution. This amounted to the operation of one or more relatively large craft that could travel the distances necessary to procure a load of fish, ice it, and return to the home dock while the fish were still fresh. What this usually meant was the boat would leave a port like Morgan City and travel up the Atchafalaya Basin buying fish and selling supplies for the space of one day, spend the night at the end of that day, and return to Morgan City the next day non-stop, or nearly so. 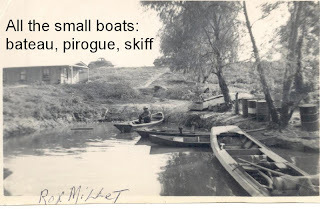 Given the size of the boats used at this time by fishermen for their daily transportation, it was very useful for the fishboat to come to the fisherman rather than him having to make the day-long trip to Morgan City. These smaller boats were dependable but desirable for long-distance travel only if necessary. So, the fishboat provided a natural solution to the problem of transportation of goods to and from the fishermen. Almost all the daily needs for food, ammunition, cloth, etc. were provided by the fishboat, including the PET milk that many babies were raised on. The functional period for these boats ran fro m the early availability of automobile gasoline engines in 1908 (Ford Model T) to the time when people moved out of the Basin in the late 1940s. Two of the boats are pictured here: the Monarch, a gas-engine powered stern wheeler, and the more typical of the boats used, the Baby Dot. Some square-fronted bateaux were also made into fishboats. The late 1940s also coincides with the growing availability of outboard engines capable of powering small boats at high speeds to and from the places to sell fish and buy groceries. The relationship between the families in the Basin and the fishboat operators could not help but be one of considerable intensity, either positively or otherwise. There was such a mutual dependence on each party to deliver his part of the arrangement that small traditions could easily arise and acquire significance. One operator who serviced the route ending each time in Keelboat Pass near Hog Island, on each trip would make some of his ice available to a family there, and some salt, to make hand-cranked ice cream. Everyone looked forward to this treat and that relationship still brings comments from the descendents of those families. The existence of the fishboats lasted only so long as there were sufficient numbers of people living more or less permanently in the Basin and harvesting large amounts of fish. 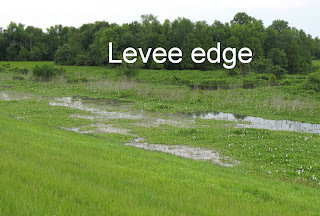 Once the levees were constructed in the 1930s and the people began to have to deal with higher and higher water in the spring of each year, more and more of them began to move to the edges of the Basin near the levees, or into the towns surrounding the swamp – towns like Morgan City, Charenton, Plaquemine, Bayou Sorrel and Pierre Part. The Myette Point people did not do this, at least not to a town. They moved to a place where they could still fish and deal with the fishboats for a little while longer, to the projection of land extending out into the western side of Grand Lake, called Myette Point. But once that happened the convenience and satisfaction derived from the fishboats gave way to more and more land-based amenities like electricity and roads and security from floods and such practical considerations drew them away from the old ways of houseboats and into houses on the bank. It became hard for the fishboats to service them and the services provided by them eventually died out, to be replaced by land-based communications and transportation. At first there were no roads along the levee where the houses were at Myette Point, and no electricity, but fish were still a valuable product and the docks in the area of Calumet and Charenton soon saw fit to connect with the fishermen by land and buy the fish, and now they could provide ice as well. Trucks would come when the weather allowed, picking up the fish and delive ring the ice. Soon a middle man system arose similar to the fishboat system in that one of the people in the new community of Myette Point began to provide a place to buy fish and iceboxes to hold them until the trucks would arrive on a more or less predictable schedule. Like the fishboat operators, the local buyer would make a few cents per pound on the fish he in turn sold the dock. After this, the new commercial process took prominence and the fishboats were discontinued, but it had been a time of distinct significance to the fishermen of Grand Lake. All of the pictures here are provided by Darlene Soule from her excellent collections. The text on them is added by me. The river is at 9.5 feet on the Butte La Rose gauge today, rising to 10.2 feet in the next couple days. The Ohio and Mississippi are both falling now. More ups and downs it seems. Crawfish is the other (other than shrimp) seasonal bait that produces well. In the late winter the water in the Basin usually begins to rise, a signal that the annual high-water phase of the cycle is pushing its way into the swamp. When the water reaches the tunnels of the female crawfish that burrowed down when the water receded in the previous year, these mothers-to-be come up from underground and release the infant crawfish that ride under their tails. These small ones will be the crop of crawfish for that year. They are also what the linefishermen look for to help increase their catch of catfish, both in size and number. Before there were levees, the people searched for this bait in any shallow area of the swamp. The routine method was to drag a small-mesh net along the bottom where there was vegetation or lilies (water hyacinths). Once the levees were built and most of the people had moved out of the swamp and onto adjacent land, the shallow water at the levee edge became the preferred place to search. Sometimes the catch was good, netting eight or ten small, one-inch or a little bigger crawfish. Much of the time it was more like two or three per dip, and it could take a long time and many drags of the net to get the thousand or more you needed every day. It is truly amazing that you could dip almost the same stretch of levee day after day and catch the bait you needed. The supply seemed sometimes to be inexhaustible. But it could run out quickly too. When you started fishing with crawfish you could usually depend on the average size of the fish you were catching on shrimp to increase. Sometimes you caught more also, but they were always somewhat bigger and that was a welcome thing after what was probably a meager winter of tightline fishing. 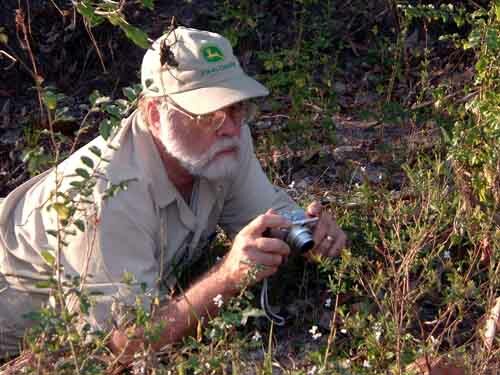 Russell Daigle shares his thoughts about the significance of crawfish versus the use of shrimp in the spring. “Crawfish is a different bait from shrimp. …crawfish catch bigger fish. Oh yeah, all the time. Everywhere you go. If you catchin a pound fish on shrimp, you put crawfish on you gone catch two and three pound fish. It’s different. For some reason or another, I don’t know what causes it, but it makes a difference. RD: I like small crawfish, something like that. [inch and a half]. Yeah. They get too big, you have to start bustin the head on em and that’s hard on the hands. Well, when they get big, the fish don’t like em anyway. JD: And I never saw you break the tail much on em…just fish with the tail? RD: No. Don’t work. You put that on a line, it gone stay right there. In the days when people didn’t always have access to just the right equipment, the decision was usually made to make do with what you had. Rubber boots, taken for granted today, were a scarce item in the Basin, and if you had some the chances were that they leaked. Neg Sauce didn’t hesitate to put up with cold water if he needed to dip small crawfish. And they didn’t seem to suffer much from sickness, such as pneumonia, related to this either. You might run into more than crawfish when you waded around in the shallow waters where the they would hide. Sometimes it paid to be careful. Edward and Lena Mae related an incident that might have been a problem. LC: I remember the last time he went back of Bayou Sale back there to dip. He like to got snakebit in the face. EC: By myself back there. He was on a limb, and I bent down there to go underneath that limb…and I was lookin at that sucker about like that [gestures]. If I’d a went another six inches I’d a hit him with my face. Lil black one, lil black congos? Cottonmouth? Other things do use the warm, shallow waters to hide in. Water beetles, salamanders, small snakes, leeches and other animals would often come up in the nets when you would drag across the vegetation. One of the things that was caught sometimes was the madtom catfish. 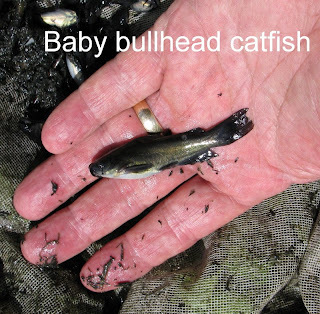 These fish grow to no more than a couple inches and look like mini ature bullhead catfish – brown or black. But they pack a venom that is dangerously debilitating. Picking through a net of squirming crawfish and other things, it is easy to puncture a finger on a spine of one of these small catfishes. The result is immediately very painful, usually progressing to immobilization of the arm that is affected. The numbness may last several hours. It is not something to disregard, and care is taken that it doesn’t happen twice. 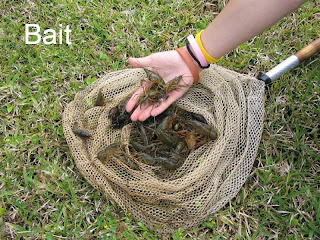 So crawfish are good bait for the line fisherman as long as there are small ones to be caught. As the water recedes in the late spring or early summer, the season for them comes to an end when all the small ones have become big ones and are therefore no longer useful as bait. At this time shrimp become the main bait and remain so until the summer low water calls for the use of cut bait, or shrimp baited at night. The river is at 7.2 feet right now on the Butte La Rose gauge, falling to 6.5 feet by the end of the week. A real up and down period we’re going through. The Ohio and Mississippi are both rising strongly way up north so we should keep going with the rising water overall. This animal is one of the two baits (the other is crawfish) that could be considered superior to shrimp as linefishing bait for the annual brief period of its use. 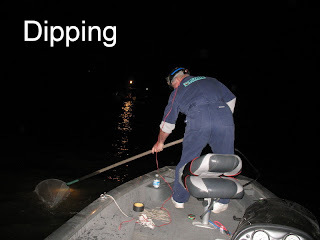 Both because the eel comes at a time when fish are harder to catch, a nd because it is so effective, catching white eel has always been one of the prized annual activities of Basin line fishermen. It almost borders on a festive occasion. People from areas many miles away on the east side of the Basin, some from as far away as Pierre Part, still trailer their boats and come 70 or 80 miles each year to catch them in Lake Fausse Point. 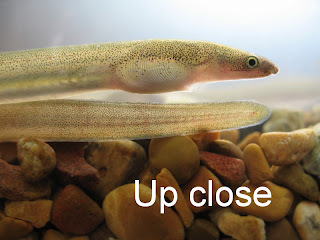 White eel, scientifically named Myrophis punctatus, is eel-like in body type as its name implies, about as thick as a pencil attaining a length of about 15 inches. Like the American eel, this animal leaves its freshwater habitat and heads for the open ocean presumably to breed. What is so odd is that the Myette Point fishermen (and other fishermen in south Louisiana) seem to know more about this animal than the scientists do. They have known for a long time, for instance, that the eel lives in shallow lakes well inland from any marine influence. They know that it will leave these shallow inland lakes when the first strong cold front sweeps across the coastal areas, and it leaves in great abundance during those first nights when the north winds blow. They know to position their boats at the outlet from those lakes and net the small eels as they swim on the surface toward the coastal river outlets. Fishermen know this in advance of scientific proof. At one time this fish was revered by the Myette Point fishermen as the best bait that could be used in the fall, if it could be found. Neg Sauce looked forward to the season when white eels could be caught and used. When asked if he can recall how long the eel has been a popular bait, EJ Daigle (born 1942) remembers far back in his life that people crossed large expanses of water in search of this fish. "That is a very, very old art. 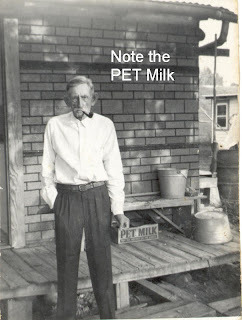 Ever since I can remember, people…I can hear Daddy talking about…they’d leave, uh, across the lake when the lake was wide open, to come places like Lake Fausse Pointe or go down [to] Lake Verret, behind the levee, before they had the levees, in order to dip white eels. " 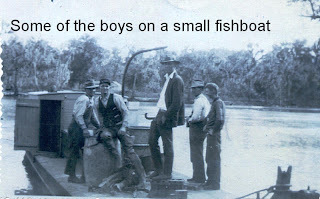 And EJ’s older brother, Russell (born 1934), even though he was too young to do the work of dipping the eels, he recalls a trip he made with the men to travel by boat from the central Grand Lake area to Lake Palourde, near Morgan City, to catch eels. A lugger is a large boat styled like the shrimp boats in Louisiana. JD: Dippin white eels. How far back does that go? RD: When I was a boy, about ten years old, I went with Albert Bailey. He used to have a lugger boat. Old Man Albert, the old man. Myon. We left there and went all the way to Lake Palourde to catch white eels, when I was about ten years old. So that’s…that’s, uh, 51 years ago. He had a big lugger, with a motor in it. We used to leave…used to go dip eels. Eight or ten of em [men] together, and go. In the fall when the water is low and clear, the catfishing with shrimp as bait can be a slow use of time. 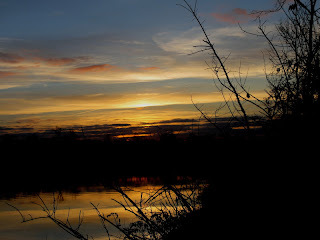 It is that part of the year when summer bentline fishing is about over and winter fishing with tightlines hasn’t begun. Shrimp are not easy to get in the fall and small fish still rob most of them if baited in the daytime, but here come the cold fronts sweeping down with the big north winds blowing cold air. Normally one would think that people who spend their whole lives outdoors doing things regardless of weather would not look forward to cold days and nights, but not so the Myette Point people. 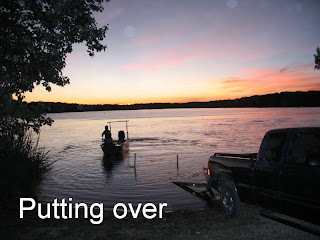 They know that when the big northers blow, causing the water to rush from the lakes into the bays and eventually into the Gulf, that is the time to make up for the slow days of fall fishing. What makes the difference is the sudden availability of this bait that catfish don’t seem to be able to resist. The white eel can be, or could be, found in shallow coastal lakes that have an outlet to the Gulf. These lakes were Lake Fausse Point, Lake Palourde, Lake Des Allemands and perhaps Lake Maurepas and White Lake. There may be others not mentioned by Myette Point fishermen. People who lived on Grand Lake don’t seem to have ever found a source of the eels inside the Atchafalaya Basin as defined by the levees. At a time when it took several hours to reach the Morgan City area by boat, they traveled long distances to Bayou Ramos and Bayou Boeuf to get eels leaving Lake Palourde. The weather for these trips would have been what one might expect during the passage of a cold front with strong, blustery winds and rain. Yet these were the only conditions that produced the migration of the eels from the lakes and so these were the conditions that were welcomed by the fishermen. If you missed the first and second night after the first frontal passage, you probably missed the eels for that year, and some of the most productive fishing. You could net several thousand of them on a good night, though 500 to 1500 seems to have been more the usual catch. They were maintained alive until used as cut bait if at all possible. The typical way to do this was to take an old boat (pirogues usually) and put several inches of water into it along with the eels, topped off with a layer of water lilies. The eels would stay alive in the boats as long as the water didn’t get warm and become oxygen depleted. Normally living burrowed into the mud, they would burrow into the thick roots of the plants and survive. When you wanted some you would just lift some of the plants and take the bait you needed. It was necessary to use them in fresh condition because the secret to why they were effective seems to have been the slime that covers their bodies when alive. When the eels die the slime deteriorates quickly. If frozen, the slime loses its effectiveness. Even trying to freeze the animals while still very fresh didn’t work. When they were defrosted, the slime would ball up and fall off and the bait would be greatly reduced in effectiveness, still better than shrimp but greatly reduced. 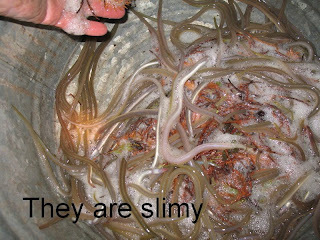 To use the eels as bait they are cut into small sections, usually ¼ to ½ inch long. Because of the slime, these sections are rolled in corn meal to facilitate handling. The skin is so tough that the hook is placed through the very edge of it, if pla ced through the center of the skin the hook is almost impossible to remove from old bait without pliers. This makes this kind of baiting slower than most of the other methods but it was always worth it. A person could be having hard times, catching barely enough fish to make a living, and all that could change the first time the eels were used. There are many stories of people catching only a few fish on a rig of line, say ten or so, and after baiting the first time with white eel the catch would increase to 100 or 150 fish. It is hard to believe, but personal experience bears this out. It is an awesome thing to see. The bait is so effective that under certain conditions it actually seems to deplete the fish population in the area where it is used. People give accounts of having to move their lines after baiting two or three times with white eel, or having to wait a week before rebaiting the lines. The eels are still in the lakes, and can still be caught on cold, harsh, blustery evenings during or after the passage of the first big cold front of the season. It is just fun to see them doing what they do. The river is at 5.4 feet on the Butte La Rose gauge, jumping to almost 9 feet by next Tuesday. That is one quick rise! It should top out there for a few days, but the Ohio and Mississippi are both falling hard again, so we have roller coaster for the crawfishermen to try to figure out. Good luck.